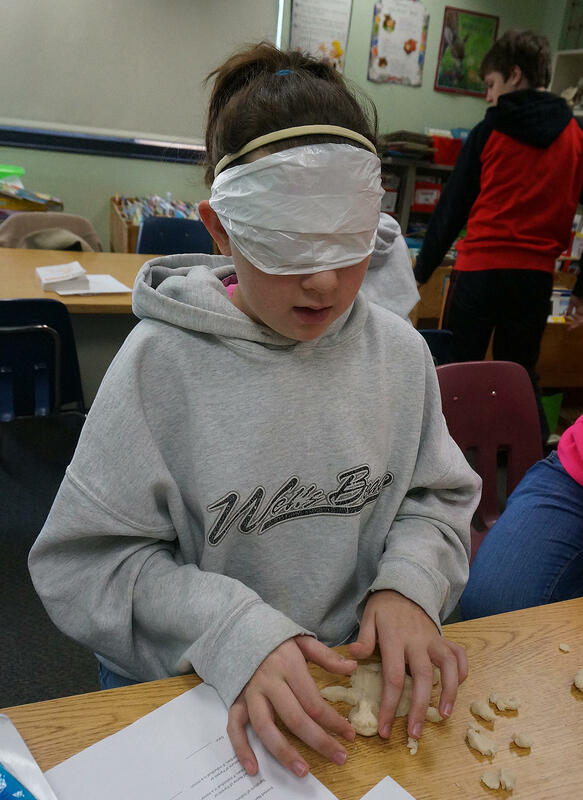 Macalyster Perry, Mason Galante, Katelyn Schugg and Madison Guay are among the West Rutland sixth graders who tried their hands at blind sculpting, an activity inspired by the book 'Golden Boy' by Tara Sullivan. Ella Paquin, Haley Parker and Tyler Serrani read the book 'Golden Boy' and came up with some challenging questions for author Tara Sullivan. The novel takes on the subject of ivory poaching, and even more shocking for the sixth graders in West Rutland, a human parallel – the murder of albino people whose body parts are thought to bring good luck. It’s a tough concept for some young readers to grasp, but West Rutland School librarian Dawn Charron thinks her students are ready to take on the book's advanced themes. Katelyn Schugg: To me, in this book it felt very intense, and I was wondering if you meant it to feel that way. Were you worried about it being so scary? When I met with them I really got a sense of how it is to live that way. To be told terrible things about why you are the way you are. Why you look the way you do. And to be told, “Hey, you’re not a real person. Hey, you’re nothing. You’re actually a zero-zero, you’re less than nothing, you’re nothing-nothing,” and how that affects people. And I wanted to be able to tell that story as honestly as I could, while showing that everyone can be something. So I would say, hold out there. I know it’s a tough read at the beginning because it’s a very difficult subject. But I promise, I’m a sucker for happy endings. Things get better. I will not leave Habo in a lurch in a way that makes you feel upset. I hope that by the time you hit the end of the book, you’ll be feeling a bit better. Ella Paquin: How did you decide that Asu would be the one to love and care for Habo? 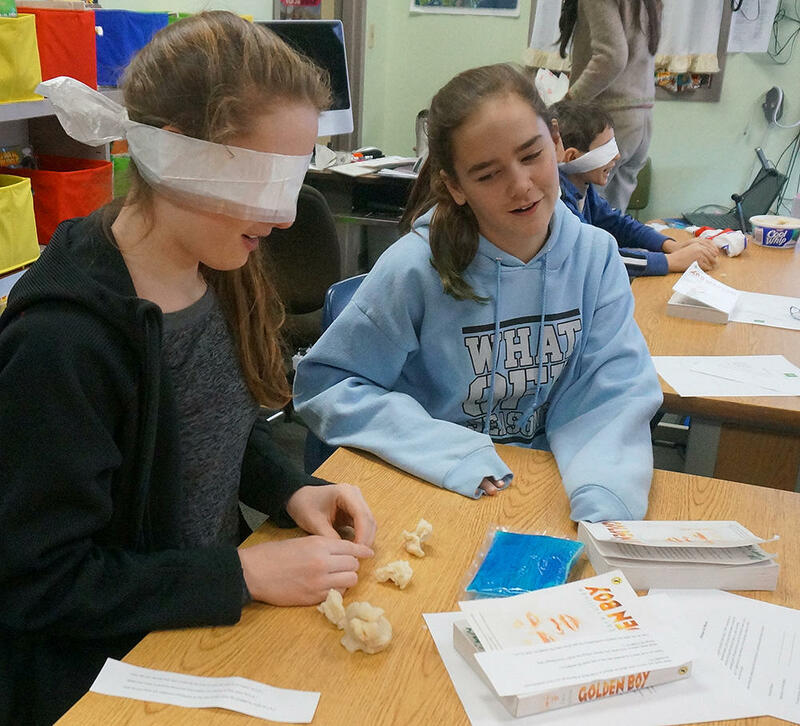 Haley Parker guides her blindfolded partner, Ella Paquin, in her attempt to craft an animal from dough while blindfolded. Tara Sullivan: When I was doing my research and finding out more about families of the children with albinism, it was hard. It was very heartbreaking. A lot of fathers leave their families because they can’t imagine that they could produce a white child, so they assume their wife was cheating on them. And so there’s a lot of abandonment ... And so, I was getting a sense through my research about a very harsh environment, a very hostile world where sometimes not even your parents would be in your corner if you were born with albinism. And, yet, finding that there were ... frequently mothers or older sisters or older siblings who would really go to bat for kids with albinism, who would really try to take care of them and step up to the plate. And Asu was easy for me to write because I have a much younger brother. He’s ten years younger than me, and so it was a character that I could connect with and put myself into and go from there. And so that’s kind of why I decided that Asu would be the one to love Habo. Elizabeth Bailey: How do you think the violence contributed to the plot of the story? Elizabeth Bailey crafts a turtle while blindfolded, learning what it might be like to be a blind sculptor like the character Kweli from 'Golden Boy'. Tara Sullivan: I think that’s a great question, Elizabeth. And I think one of the things that I struggled with while writing this was how to portray the violence. Because I don’t like books that are just violence, violence, violence all over the place with no real purpose to it. But at the same time I was trying to tell a story about a really horrific thing, where people are attacking other people and hacking them to pieces, and maiming them and injuring them and murdering them. And to try and find a way to tell that story with the right amount of violence was something that I definitely struggled with – something that I thought about a lot. And so, what you might notice is that the violence that I describe is rarely aimed at characters ... So there’s a scene with an elephant, where Habo and his brother come across a poacher who is poaching ivory. And I included the graphic violence in that scene, as a way to sort of just put the idea of the violence, the kind of violence that I was talking about, into readers’ heads. But that kind of violence is never delivered onto people in the book. Mason Galante: What language are the names in? Tara Sullivan: That is such a good question! So the names are in Swahili and they actually mean things in Swahili ... So Habo, the main character, is short for dhahabu, which is the Swahili word for gold, which is where he gets his nickname Golden Boy from his sister Asu. Asubuhi is short for morning. Kito, his little cousin, means jewel in Swahili. And Kweli, one of my favorite characters from the second half of the book, his name means truth. Madison Guay: What did you find most surprising about the information, when you took information for this book? Tara Sullivan: I wrote the first draft of the book completely based off of research that I could do from my own home ... And then once I had a first draft of the book written, I took kind of a leap of faith. I booked a ticket to Tanzania and I traveled the path of the book. So, I wanted to make sure that the story that I was putting out there was as accurate as I could possibly make it, was as true-to-life and honest as I could possibly make it. And so that little map that you see at the beginning of the book where it traces Habo’s journey, I actually followed Habo’s journey – went to every setting in Tanzania and added in things that you could only find out when you’re there like the color of the dust and the types of trees that they had in a particular region and the taste of the food, and all the rest of that. And I think some of the most surprising stuff was just finding out how much the internet got wrong, and figuring out how to deal with it. So, the book originally ended in Dodoma, which Google helpfully told me was the capital of Tanzania. Well it turns out Dodoma was just the hometown of someone with a lot of power, and so they plopped Parliament in this tiny-tiny town. And there’s nothing in Dodoma other than the Parliament building and one spare donkey, like there’s really no city in Dodoma to end a story in. And so at the last minute, here I am in Tanzania, I’m like, “Oh my goodness, I need to get somewhere where I can end this story.” I ended up booking a last minute ticket to Dar es Salaam, which is a huge international city and the capital in all but name. And it was there as I was peddling around, you know I found a carver’s market that ends up being a major part of the ending of the book, that I didn’t know existed until I started walking around Dar es Salaam. So, yeah, the research was definitely a layered thing, a multi-faceted thing that I did one thing at a time, and there were some really big surprises. Next month on Dorothy’s List, P.S. Be Eleven by Vermont College of Fine Arts Professor Rita Williams-Garcia. Dorothy’s List is sponsored by the VPR Journalism Fund.